Signature stamps is being utilize in all aspects of business and it is fast becoming a necessary component for all businesses. If you are talking about teachers, they are tired of signing again and again hundred times in a day. Signing, again and again, can be a daunting task if you are required to sign hundreds of documents in a day. So don’t waste your time by signing again and again. Just design a signature stamp to sign the documents. Signature stamps help you save time, energy and money. If you are a businessman, you have to move from one place to another for meetings or business purpose. But in your office, they need a signature on documents, legal paper, invoices, and bills. It is not possible to sign the document quickly if you are not in an office. This is when signature stamp will work in your absence. Whenever you are designing your signature stamp, you can choose a font style that you want. We are able to create a unique stamp for your business. Time-saving is very important for all. Rather than signing each document again and again just design your stamp. It will save your time from signing the document or copies of invoices. It will give a professional look to your business and positive or professional impression to your business. This can be used in the absence of signee, in repeatedly signing a document and individual document unable to sign document manually. It can be used in the accounts department. 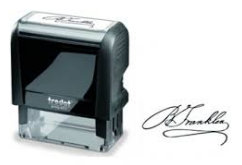 The signature stamp is an efficient and clean way to stamp the document or cheque. Whether you are using it for one document or several documents, we offer you signature stamps options at a great and affordable price. We have many designs for your signature stamp. Choose according to your requirement. We can personalize signature stamp according to your artwork, signature and font size you want. We make your routine task simple. Our signature stamps are available in a wide hue of design and colors. Signature stamps add style and professionalism to your business. We will customize your stamp to fit your professional requirement. These are available as pre-ink and self-inking. Signature stamps can also be used in legal matters. For ordering the signature stamps, contact the Ideal Stamp Shop.